With plenty of moving services, Meathead Movers is fully prepared to get you settled in your new home. Our clean-cut student-athlete Northridge movers are dedicated to fulfilling all your moving needs efficiently. Although several devastating earthquakes threw Los Angeles’ Northridge neighborhood into the spotlight in the past, this charming community quickly bounced back and deserves to be famous for much more than that. If you’re relocating to the Los Angeles area, Northridge is a great option to consider. 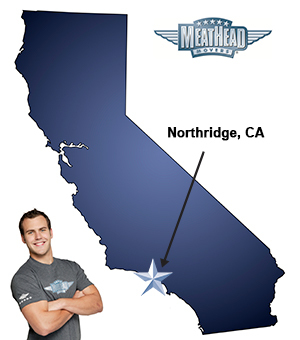 You won’t find better Northridge movers than Meathead Movers because we’re willing to do whatever it takes to make your move as smooth and easy as possible. Whether you realize it or not, you’ve probably already seen this northwest San Fernando Valley neighborhood on several occasions. It is popularly used as a filming location. Elliot’s neighborhood in the movie “E.T. : Extra Terrestrial” is actually Porter Ranch, which is situated in the north section of Northridge. More recently, scenes from movies like “Superbad” and “Legally Blonde 2” were filmed on the sprawling California State University at Northridge campus. Northridge isn’t a place that’s frequented by tourists, and that’s a good thing if you prefer peace and quiet over the chaos that you commonly find in other Los Angeles areas. Think of Northridge as suburbia at its finest, but keep in mind that some of L.A.’s best sights and attractions are within easy driving distance at all times. You can also explore the lovely CSU-Northridge campus and its botanical gardens, library and art galleries more quickly. One of the last orange groves in the San Fernando Valley is also found there. With the help of Meathead Movers’ clean-cut, student-athlete Northridge movers, you can begin experiencing all that Northridge has to offer in no time. Meathead Movers are often called the white knights of the moving industry. It’s easy to see why. When you hire us to help you relocate to Northridge, you’ll be able to take advantage of exceptional concierge-style services. We can arrange everything from handymen to security system installers. In addition to our local, long-distance, and commercial moving services, we also can help you with packing, storage, and on-site relocations. Meathead Movers, simply put, is the best choice for your moving needs. When you are looking for a moving company, there are many things to consider, but we believe you’ll find our Northridge movers to be on a completely different playing field. We look forward to exceeding your expectations. With a 100% satisfaction guarantee, you have nothing to lose. Pick up the phone and call Meathead Movers today. Moving to Northridge? Here are some helpful resources. “Great phone Customer Service by Jake! The packers and the movers worked well and efficiently. It is very easy to book a move and on the day of the move everything went smoothly and efficiently. Total pros. Fast, positive, efficient. A great job.